Stiff competition was the order of the day as Under 15 athletes from across the territory showed that the future of British Virgin Islands Track and Field is bright, as they displayed their running, jumping and throwing abilities, during the weekend Premier Dental National Youth Championships at the A. O. Shirley Recreation Grounds. The event—rescheduled from last weekend—also marked the 20th IAAF World Athletics Day. The 2-day competition also brought together athletes who competed in the 2015 Inter Primary Championships A and B Divisions as well as U15s from the Elmore Stoutt High School Inter-house Sports Day, all of whom met for the first time. Several double and triple winners emerged from the competition that also saw an exhibition Kiddies Athletics event. 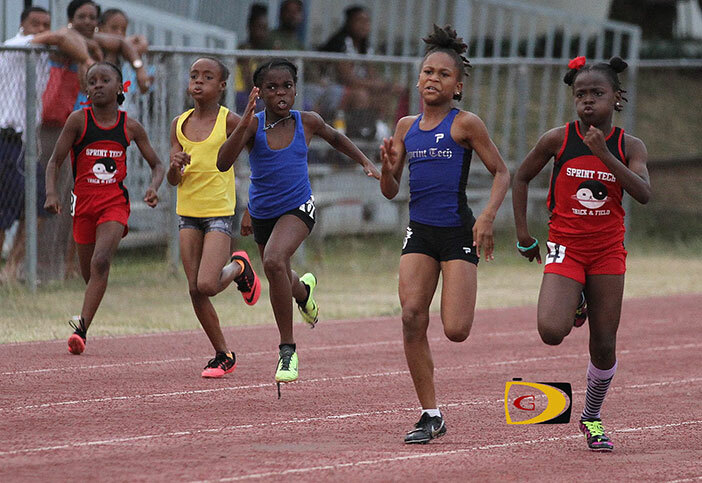 Sprint Tech’s A’Keela McMaster fended off teammate Jahtivya Willams to complete an U11 Girls 80m/150m sprint double in 11.53 and 21.12 to Williams’ 11.64/21.21. Williams had the better of McMaster during the 80m prelims, 11.27-11.43. McMaster won the Long Jump with a 3.49m measurement jumping into a -1.3 meters per second headwind, to complete her triple. M’Kori Crabbe of Top Notch Track Club was the class of the U11 Boys taking the 80/150 double in 12.41-12.45 over Raw Skillz’s T’Khoy Stevens in the 80m and 21.69-22.09 in the 150m into a -2.6 meters per second wind. Raw Skillz’s D’Neigh Williams had an U13 Girls sprint double taking the 100m in 13.45 and the 200m in 27.65. She was fourth in the Long Jump with a mark of 3.96m. Top Notch’s Xiomara Malone need a 200m personal best of 26.80 seconds over Fast Lane’s Zara Brown’s 26.96 to pull off her double with a 4.60m career best effort in the Long Jump. Brown took the 100m in 13.37 after a 13.13 prelims run. Sha’eel Lavacia won the Long Jump with a leap of 4.98m and had a 50.84m mark in the U13 Boys Ball Throw, for his double double, competing for Top Notch, while teammate Malaki Smith ran 12.93 seconds in the 100m and an unchallenged 26.83 in the 200m after 12.63 and 26.19 in the prelims. He also cut the sand at 4.10m in the Long Jump for fifth then won the High Jump after clearing the bar at 1.35m. Kori Penn of Top Notch and Raw Skillz’s Shamoi Dore of Willard Wheatley Primary School, split their U9 Boys 60m and 150 with Penn edging Dore by 0.02 in the 60, 9.46-9.48. Dore got the nod over Penn in the 150m as both raced to a dead heat in 23.14 seconds. Penn won the Long Jump with a leap of 3.20m into a -2.6 headwind. Running in the Top Notch colors, Chaz Fahie had a best effort of 62.68m in the Baseball Throw, then ran 2 minutes, 13.58 seconds in the 800m and 42.93 in the 300m for his U15 Boys triple. The next meet will be the CAC Age Group Championships trials on May 30, followed by the season ending Johnny Hassan Relays on June 5. Work will begin on taking up the track and laying a new surface on June 15.